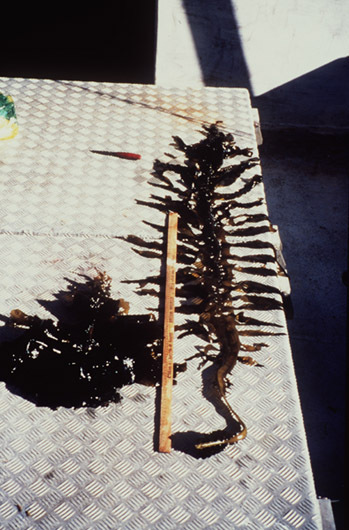 Undaria pinnatifida is a brown seaweed that can reach an overall length of 1-3 metres. It is an annual species with two separate life stages. The macroscopic stage (the sporophyte), usually present through the late winter to early summer months and a microscopic stage (the gametophyte), present during the colder months. The sporophyte is golden-brown in colour, with a lighter coloured stipe.It has a strap-like midrib full length of thallus, 1-3cm wide; edges of midrib expanded as thin membranous pinnatifid blade; pinnnae 50-80cm long, blade dotted with white cryptostomata and dark gland cells, terminates well short of base; naked basal section of midrib forms stipe. As sporophytes mature two thickened fluted sporophylls develop, one along each edge of stipe, and bend laterally around stipe with folds becoming interleaved, always in two discrete pieces.The gametophyte is microscopic. The spiral sporophyll and the midrib are the key identification features. The life cycle of U. pinnatifida is complex. The macroscopic sporophytes grow during winter and release spores as summer approaches.These spores which are microscopic disperse and settle down to germinate into gametophytes, when conditions are favourable these gametophytes produce sperms and eggs which fertilise and grow into the plant ie. the sporophyte. Temperature, light and depth are all important cues in development (NIMPIS, 2002). Overwhelmingly the main use of undaria is as human food. It is essentially a staple of the Japanese and Korean diets and is also widely consumed in Japan. Undaria pinnatifida is described as an opportunistic seaweed able to rapidly colonise new or disturbed substrata and artificial floating structures. It occures in dense, vigorous stands on benthic shores, forming thick canopy over the biota in a wide range of shores varying in exposure, from low tide level down to 15m in clear waters. \r\nUndaria inhabits cold temperate coastal areas and grows best in waters below\r\n12° C. Sporophytes are reported to degrade at temperatures above 20° C and\r\ndie at temperatures greater than 23° C.\r\nUndaria pinnatifida grows in a wide range of wave exposures from sheltered marinas to the open coast, and extends vertically from the low intertidal to 18m depth\r\n(although it is most common between 1 and 3m depth). It tolerates a wide range\r\nof irradiance from full sunlight to very low light levels, but is unlikely to invade\r\nareas with a high fresh water input. \r\nUndaria can grow on any hard surface including artificial substrates such as\r\nrope, pylons, buoys, the hulls of vessels, bottles, floating pontoons and plastic.\r\nOn natural substrates, undaria inhabits stable rocky reefs, mobile cobble\r\nhabitats, mudstone, and in primarily soft sediment habitats attaches to hard\r\nsurfaces such as shell. It can also grow on seagrass (while a small\r\nsporophyte), the shells of abalone and bivalves, invertebrates and epiphytically\r\non other seaweeds (MFish, 2001). Asexual/sexual. Annual heteromorphic life cycle alternative between the diploid macroscopic sporophyte and the haploid microscopic gametophyte (NIMPIS, 2002). The accidental translocation of undaria through aquaculture and fisheries activities.The release of the species in ballast water discharged from vessels. Various types and life stages of species can be transported in ballast water.This vector can introduce species through a variety of means. 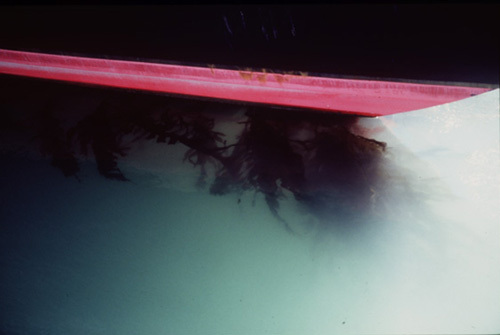 Three examples are: (1) The spawning of a fouling species on a vessel in port (2) The dislodgement of fouling species from a vessel in port and (3) The sinking of fouled vessels either deliberThe accidental release of undaria, imported for human consumption, it is a staple in the Japanese and Korean diets. Review: Dr. Marc Verlaque, CNRS Centre d'Oc�anologie de Marseille, France. Recommended citation: Global Invasive Species Database (2019) Species profile: Undaria pinnatifida. Downloaded from http://www.iucngisd.org/gisd/species.php?sc=68 on 19-04-2019. The impacts of Undaria pinnatifida are not well understood and are likely to vary considerably depending on the location. Undaria can change the structure of ecosystems, especially in areas where native seaweeds are absent (Mfish, 2001). NIMPIS, 2002 states that U. pinnatifida has the potential to become a problem for marine farms by increasing labour and harvesting costs due to fouling problems on fin fish cages, oyster racks, scallop bags and mussel ropes. Heavy fouling may also restrict water flow through cages. The Department of Conservation in its brochure \"Gorse of the Sea\" state that undaria could foul mussel farms, salmon farms and boats. Heavy infestations of undaria may also clog marine farming machinery, slow growth of mussels and restrict water circulation.Heavy fouling of boats seriously decreases their efficiency. Preventative measures: Undaria has a microscopic phase in its life cycle, and it is thought that eradication of this species is unlikely to succeed. The approach to undaria management would thus be to slow its spread and reduce the chances of it reaching new locations. In addition to natural dispersal the role of human mediated vectors; ballast water, attachment to hulls, marine equipment etc plays a major role in the spread of undaria. Vector management and awareness would go a long way in slowing its spread. 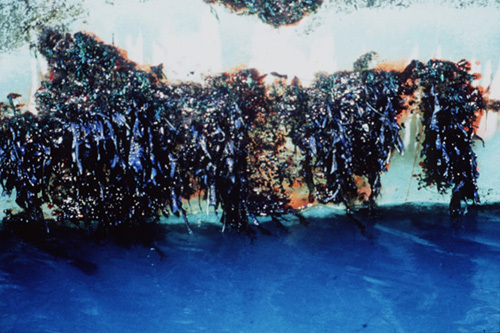 In the long-term, it is hoped that eventually there could be systems to treat vessel hulls with UV light or high-pressure, heated water to kill harmful spores and bacteria quickly and efficiently (MPA NEWS, December 2004/ January 2005). All of the non-native potential target species identified in this report are ranked as high, medium and low priority, based on their invasion potential and impact potential. A hazard ranking of potential domestic target species based on invasion potential from infected to uninfected bioregions identifies Undaria pinnatifida as a 'medium priority species' - these species have a reasonably high impact/or invasion potential. Informations on Undaria pinnatifida has been recorded for the following locations. Click on the name for additional informations. Brown, M. T. and Lamare, M. D. 1994. The distribution of Undaria pinnatifida (Harvey) Suringar within Timaru harbour, New Zealand. Japanese Journal of Phycology 42: 63-70. Castric Fey, A., Beaupoil, C., Bouchain, J., Pradier, E. and L Hardy Halos, M. T. 1999. The introduced alga Undaria pinnatifida (Laminariales, Alariaceae) in the rocky shore ecosystem of the St Malo area: morphology and growth of the sporophyte. Botanica Marina 42: 71-82. Castric Fey, A., Girard, A. and L hardy Halos, M. T. 1993. The distribution of Undaria pinnatifida on the coast of the Saint Malo (Brittany, France). Botanica Marina 36: 351-358. Cecere, E., Petrocelli, A. and Saracino, O. D. 2000. Undaria pinnatifida (Fucophyceae, Laminariales) spread in the central Mediterranean: its occurrence in the Mar Piccolo of taranto (Ionian Sea, southern Italy). Cryptogamie, Algologie 21: 305-309. Curiel, D. Guidetti, P. Bellemo, G. Scattolin, M. Marzocchi, M. 2002. The introduced alga Undaria pinnatifida (Laminariales, Alariaceae) in the Lagoon of Venice. Hydrobiologia. vol. 477, no. 1, pp. 209-219. Summary: Study on undaria invasion in Venice, Italy. Fletcher, R. L. and Farrell, P. 1999. Introduced brown algae in the North East Atlantic, with particular respect to Undaria pinnatifida (Harvey) Suringar. Helgolander Meeresuntersuchungen 52: 259-275. Fletcher, R. L. and Manfredi, C. 1995. The occurrence of Undaria pinnatifida (Phaeophyceae, Laminariales) on the South Coast of England. Botanica Marina 38: 355-358. Floc h, J. Y., Pajot, R. and Mouret, V. 1996. Undaria pinnatifida (Laminariales, Phaeophyta) 12 years after its introduction into the Atlantic Ocean. Hydrobiologia 326/327: 217-222. Floc h, J. Y., Pajot, R. and Wallentinus, I. 1988. The Japanese brown alga Undaria pinnatifida on the coasts of France and the possibilities of its establishment in european waters. International Council Exploration Sea, CIES, Bergen 10 October 198. 16pp. Forrest, B. 2000. A management strategy for the Asian kelp Undaria? Aliens 12. Summary: Study of dispersal of Undaria pinnatifida. Hay, C. H. 1990. The dispersal of sporophytes of Undaria pinnatifida by coastal shipping in new Zealand, and implications for further dispersal of Undaria in France. British Phycological Journal 25: 301-313. Hay, C. H. and Luckens, P. A. 1987. The Asian kelp Undaria pinnatifida (Phaeophyta, Laminariales) found in a New Zealand harbour. New Zealand Journal Botany 25: 364-366. MPA NEWS: International News and Analysis on Marine Protected Areas. Vol. 6, No. 6 December 2004/ January 2005. Invasive Species: Their Threat to MPAs, and How Practitioners Are Responding . National Introduced Marine Pest Information System (NIMPIS), 2002. Undaria pinnatifida species summary. National Introduced Marine Pest Information System (Eds: Hewitt C.L., Martin R.B., Sliwa C., McEnnulty, F.R., Murphy, N.E., Jones T. & Cooper, S). Summary: Description and other Species information. Web publication [Accessed: 3/25/2004]. Saito, Y. (1975). Undaria. IN: Advance of phycology in Japan, (Tokida, J., Hirose, H. Eds) Dr. W. Junk b.v., The Hague304-320. Sanderson, J. C. 1990. A preliminary survey of the distribution of the introduced macroalga, Undaria pinnatifida (Harvey) suringar on the coast of Tasmania, Australia. Botanica Marina 33: 153-157. Silva, P.C. Woodfield, R.A. Cohen, A.N. Harris, L.H. Goddard, J.H.R. 2002. First report of the Asian kelp Undaria pinnatifida in the northeastern Pacific Ocean. Biological Invasions vol. 4, no. 3, pp. 333-338. Summary: Distribution of undaria in the Pacific. Undaria Brochure. Department of Conservation and Ministry of Fisheries, New Zealand. Undaria kelp Undaria pinnatifida Part 1, Identification Guide, Department of Fisheries, New Zealand. Undaria kelp Undaria pinnatifida Part 2, Identification Guide, Department of Fisheries, New Zealand. Boudouresque, C. F., Gerbal, M. and Knoepffler-P�guy, M. 1985. L algue japonaise Undaria pinnatifida (Phaeophyceae, Laminariales) en M�diterran�e. Phycologia 24: 364-366. Casas, G. N. and Piriz, M. L. 1996. Surveys of Undaria pinnatifida (Laminariales, Phaeophyta) in Golfo Nuevo, Argentina. Hydrobiologia 326/327: 213-215. Dept. of Fisheries, Introduced Marine Aquatic Invaders. Guiry, M.D. & Nic Dhonncha, E., 2005. Undaria pinnatifida AlgaeBase version 3.0. World-wide electronic publication, National University of Ireland, Galway. AlgaeBase is available from: http://www.algaebase.org; Undaria pinnatifida information is available from: http://www.algaebase.org/speciesdetail.lasso?species_id=350&sk=0&from=results&-session=abv3:82D8C9F5076c500931kSpSC20074 [Accessed 04 March 2005]. Knoepffler P�guy, M., Noailles, M. C., Boudouresque, C. F. and Abelard, C. 1990. Phytobenthos des Pyr�n�es Orientales: compl�ment � l inventaire, pr�sence d esp�ces non-indig�nes (Sargassum et Undaria). Bulletin Soci�t� Zoologique France 115: 37-43. Leliaert, F., Kerckhof, F. and Coppejans, E. 2000. Eerste waarnemingen van Undaria pinnatifida (Harvey) Suringar (Laminariales, phaeophyta) en de epifyt Pterothamnion plumula (Ellis) Nageli (Ceramiales, Rhodophyta) in Noord Frankrijk en Belgie. Dumortiera. Perez, R., Kaas, R. and Barbaroux, O. 1984. Culture exp�rimentale de l algue Undaria pinnatifida sur les c�tes de France. Science et Peche 343: 15pp. Perez, R., Lee, J. Y. and Juge, C. 1981. Observations sur la biologie de l algue japonaise Undaria pinnatifida (harvey) Suringar introduite accidentellement dans l �tang de Thau. Science et Peche 325: 12pp. Rismondo, A., Volpe, S., Curiel, D. and Solazzi, A. 1993. Segnalazione di Undaria pinnatifida (Harvey) Suringar a Chioggia (Laguna Veneta). Societa Veneziana Scienze Naturali, Lavori 18: 329-330. Santiago Caamano, J., Duran Neira, C. and Acuna Castroviejo, R. 1990. Aparicion de Undaria pinnatifida en las costas de Galicia (Espana). Un nuevo caso en la problematica de introduction de especies foraneas. CIS Santiago de Compostela, Informes Tecnicos 3.